Rev. Moises Bejarano has a deep desire to bring cultures together and break down barriers that he sees dividing today’s church. And he’s doing just that in his own congregation. New Hope Center, the Free Methodist church he pastors in Chino, California, is a growing group of people from diverse backgrounds, including Mandarin, Filipino, Latino, and African American, that is working to transform lives through reconciliation and unity both in the Chino Valley and internationally. New Hope Center began in 2016, after Moises had been simultaneously pastoring two Chino congregations less than a mile apart. To bring the different cultures of each church together rather than continuing to pastor them separately, he decided to merge both the congregations and church names–Hope Center and New Hope Christian Fellowship–to form a new church plant, New Hope Center. 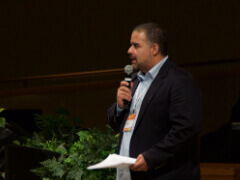 “All the barriers that were there in our churches in the last year have been torn down,” says Moises. Some of these barriers included having two separate congregations–one of English speakers and one of Spanish speakers–along with holding worship services in different buildings. Once the two churches merged, the pastoral staff saw the ministry begin to take a different shape and the racial and relational issues that existed before between congregants began to dissipate through prayer, collective service projects, and intentional relationships. “The Free Methodist core freedoms are in our DNA. We are really intentional when it comes to who we are,” says Moises. Moises does not describe his church congregation as multicultural, referring to a group that has several cultural groups living alongside each other but not necessarily engaging with each other. “We are intercultural,” he emphasizes. “We respect different diversities and do not have a main culture that defines us.” He describes his congregation as a community that has a broad respect for all cultures and has developed deep relationships between the different race and culture groups represented. One of the ministries of New Hope Center that Moises is most proud of is working to reopen and run an orphanage in Valle las Palmas, Tecate Mexico, that will serve 100 children. Led by church member Jose Araiza, the volunteers in this ministry have been busy establishing relationships with the people of the small town and have recently re-opened the water well that sits on the property. The orphanage, which is awaiting inspection, is slated to open by September 2017. Sponsorship opportunities will be available for people to become partners in this ministry. Along with the orphanage project, many other ministries are thriving at New Hope Center. Later this year, members of the church are going to Taiwan for 15 days to minister alongside a partner church there. The church has also opened a ministry for addiction recovery that serves all races and cultures in the Chino valley and offers homeless services (food distribution and showers), along with after-school tutoring for children in the community. Moises has plans to grow these ministries within and beyond his church, and his focus is New Hope Center’s Free Methodist foundation. “The Free Methodist core freedoms are in our DNA. We are really intentional when it comes to who we are,” says Moises. “Our DNA is in all of our messages and ministries. It’s in all of our relationships.” From the sermons he preaches on Sundays to the conversations that take place in his congregation, Moises says the church emphasizes the five core freedoms in everything they do. “We have no class, race, or gender levels in our church,” he reiterates. Everyone belongs. Everyone serves. In short, Moises says the Holy Spirit is at work at New Hope Center, changing lives and restoring broken families. The congregation has welcomed newly adopted foster children and formerly homeless people into their church family and continues to grow. “God is at work here,” he says. And one just has to step through the doors of New Hope Center to feel that truth.